Michelle Obama Recounts Teen Barack's "Click-In Moment"
Vice President Joe Biden mercifully does not show up at the White House bearing gifts of guns for Malia and Sasha Obama, First Lady Michelle Obama told "The Daily Show" host Jon Stewart on Tuesday. First Lady Michelle Obama told Jon Stewart on Tuesday how her husband's academic ambitions coalesced as a teen — and what sort of would-be uncle Vice President Joe Biden is to their daughters. The first lady appeared on "The Daily Show" Tuesday to discuss her new book, "American Grown," about the vegetable garden she planted at the White House, and her efforts to combat childhood obesity. Although Stewart joked about how hard it is to get kids to want to eat well and jotted down some notes as the first lady advised, what he really wanted to know was whether she had been the one to put the kibosh on Barack Obama's youthful drug experimentation. She wasn't. That phase was long over by the time they met, she said. "By the time he was in college, like so many young people, he realized that he could do more with his life," Michelle Obama said. "I think when he lost his father, that was one of his click-in moments." She also ticked off her husband's accomplishments during his first presidential term and touted his decision-making since he took office. "I kind of watch this thing pretty closely," she joked. "I see him being so consistent in disregarding the chatter and the noise and really moving forward toward a country where there's more equity, more fairness." And she laughingly stood by her fondness for the gaffe-prone vice president — despite Stewart's doubts about his fitness as a role model for first daughters Malia and Sasha. "Is it hard though to raise a kid around Biden? Because I would assume that there's a lot of like, 'Joe, language!'" Stewart mused. "Or he's like the uncle that comes over, and [you're] like, 'Oh, you brought them guns!' Is that tough?" he asked. "No, he's a great vice president and a great friend. My kids hang around him, and I'm good with it!" the first lady insisted. 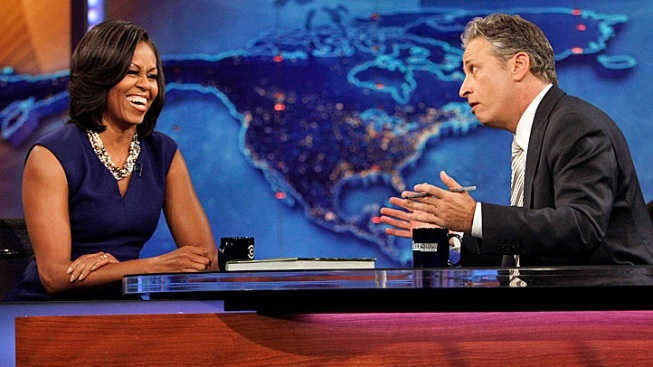 See Michelle Obama speaking with Jon Stewart below.